Exactly as described. Photo matches perfectly. 4x6 is GREAT for small rooms. Doesn’t fit under full size bed or larger but great as small area rug. This rug was represented well, it's a beautiful rug. I have gotten many compliments on the looks and the quality of the rug. The colors were well matched to the pictures of it. I couldn't be happier with this purchase, I'd highly recommend this product. This rug is beautiful with the colors and it’s very soft. Perfect size for my small living room table. The quality is great and arrived fast! Love this rug. Colors are true to pics. Great buy. Will need something underneath to prevent slippage, either strips or rug mat. This is the 3rd Safavieh rug I bought for my home. The quality of the rug is very good and soft. It is not thick, so if you prefer something with more cushion, this would not be a good pick. The color is darker than the photos online, it makes the design pop a bit more, I like it! Good product overall! I recommend this rug. The colors are beautiful and is as pictured. It is a good quality and easy to clean. The non skid pad recommended is a good idea. I loved the rug. Safavieh is my favorite brand rug. The rug is very pretty and fits my space perfectly. However, the pattern is NOT what is shown in the picture! The colors are reversed? The photo shows more teal/turquoise and less navy blue. But it works for my space. Also the medallions shown in the photo....don’t have those mine is a floral print with paisley around them. Still very pretty but not same pattern shown on the website. Feels very soft when walking on it with bare feet. Rug had flattened out within a couple of days. I laid it facedown for a couple of days to get the ripples out. Has not shed either. I did notice that some of navy blue rub off onto my nails. Not sure why that was happening. Hopefully the dye will not be an issue with the floors but I do have a rug pad underneath. Otherwise, it slips horribly. So just a heads up the pattern is not the same as dipicted on the O website and you definitely will need a rug pad. 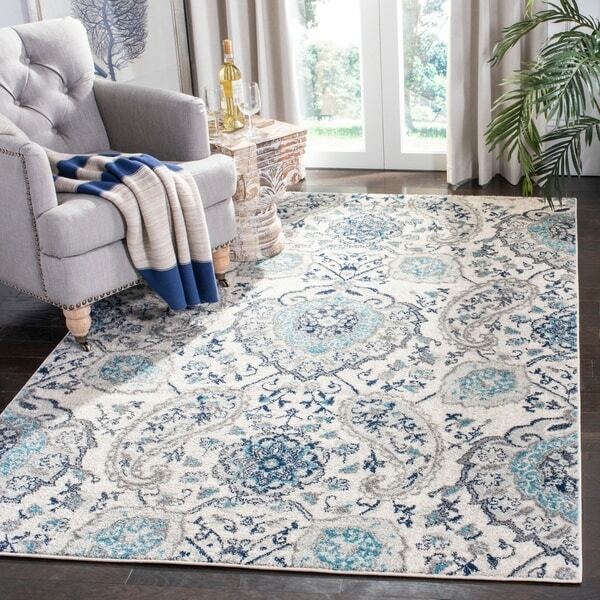 This is a very beautiful, elegant area rug with gorgeous shades of light blue, cream and a touch of grey. Looks more expensive than it is, feels great and soft on bare feet and it’s delicate design is not at all overpowering. I usually prefer rugs that have a border of some kind, this one doesn’t but I love it justvthe same. I bought The 4x6 and went back to buy an 8 foot runner. Very classy area rug. Love it. so in love with this rug! its a perfect blend of greys, blues and creams for my grey dinning room and front entry. Its low pile but that is exactly what I was looking for, for this particular space. Great overstock purchase! Looks nice color is right on. A little thin and the corners curl up so definitely need sticky’s to keep it in place. 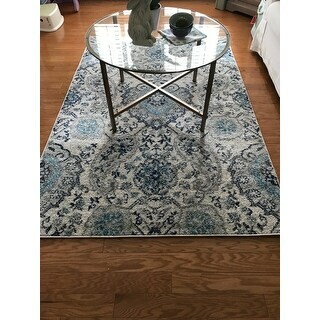 Overall a nice looking rug for the price. Love the colors! Exactly what I was looking for. 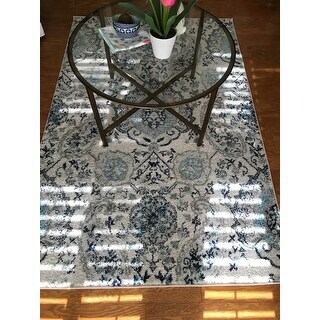 I just love this entry rug I ordered to match my living room rug. It was delivered quickly and within 2 days all ripples straightened out and it is just beautiful...the blue, gray and cream colors are lovely. Not as nice in person. Looks much better in the picture. Looks pretty cheap in real life. A little disappointed but a decent rug for the price. And one good thing is it didn’t have a bad odor like a lot of other rugs I have ordered. Nice rug for our upper level area to warm up the wood floors in the main area and blends well with the decor in that area. I bought the larger size last year at our previous home and added this one since there is more of a hardwood area that needed a warm touch. Gorgeous rug with interesting design. You can't go wrong with this brand. Nice blend of blue, gray and ivory in this rug. It fills my space quite nicely and is soft underfoot. I bought it along with 2 others in the same pattern that I used in other locations in my home. THis rug is not the quality that I had hoped for; it's thinner than expected, but the color is fine and we will use them in the bedroom where the wear and tear is less than in other spaces. We love this rug! It’s soft and sturdy and just as pictured. It laid flat almost right away. As advertised, mid=weight rug with a nice transitional pattern. Brightens up the room nicely and coordinates with other rugs. "Is there a difference between the Madison Paisley and the Madison Bohemian rugs? I have bought several of the Bohemian version and I want them all to match. Both rugs seem to have the same stock photos. A certain size that I would like to get says Madision Paisley. Just making sure. Thanks"
They are the same rug, one of the pictures is incorrect and we will update it right away. "Photos 1&7 are a different rug than shown in photos 3&4. Which rug am I buying?" These are all the same rug, just at different angles, and zoomed in and out. We apologize for any confusion. "The pictures of this rug show two clearly different rugs. One has prominent paisley and the other has a more feathery look. One is far more busy than the other too. Which rug am I buying?" The first picture is the most accurate depiction of the rug. Agree with the other person who answered. The first pic represents the product well. Zoom into pic one a few times to get the full detail. It is exact to what I received. The first picture looks like the rug I purchased. It has a paisley pattern and feathery designs. The color in that first picture is accurate, shades of blue and gray. "Is this rug exactly 4' x 6'? Sometimes they say 4' x 6', but the dimensions are smaller than that." As this rug is individually made, there may be slight variations in the finished dimensions. "What are the colors in the rug? Is the one color blue or teal"
The color is more blue than teal. The rug did not work for me so I returned it. It was too busy. Linda S.
It is blue. Works great in my daughters bedroom. "Does this rug come in a 3x5?" This rug is not currently available in a 3x5 size.